This Stage 3 clutch kit comes with everything you need IF your machine did NOT come with the good TAS-03 secondary clutch. This clutch comes on various 2015 RZR 900 models from the factory and it's best to check your secondary clutch before purchasing. View our images to see what the different clutches look like. This kit includes our magnetic adjustable Goldstar clutch weights. These weights offer a superior profile for big acceleration. They are very easily adjustable with snap in/out magnets. The kit also includes our custom primary spring which improves clutch backshift and helps hold peak RPM without as much fade as the factory spring. We also custom cut a helix to greatly help acceleration and shift out. This helix is aggressive (unlike the factory setup) and really comes out of the gate strong. It's paired perfectly with our secondary spring which provides better backshift and upshift on the secondary clutch. Both the secondary spring and helix are loaded into your new TAS-03 Tied secondary clutch. This clutch provides much quieter, smoother shifting while giving us the ability to install tuned helixes that make a huge difference in clutch performance. If your machine came with the cheaper secondary, this kit is an absolute must-have whether you have a stock or modified machine. 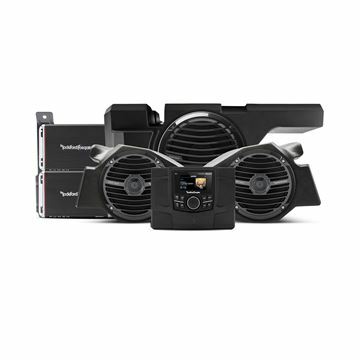 The TMS65 full range coaxial speaker is designed for direct fitment application in 2014 and newer Harley-Davidson® motorcycle in both the fairing and Tour-Pak locations. 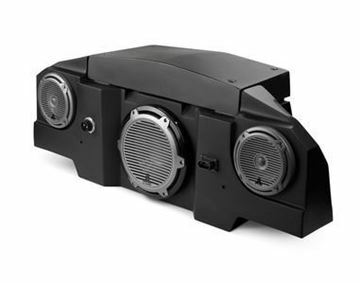 This speaker directly replace the existing factory speakers using the factory mounting hardware and speaker connectors. It features a compact Neodymium motor structure driving a co-molded, reinforced polypropylene cone with Santoprene surround This ensures that you get maximum frequency response and output in both the mid and low frequency range. It also features an ultra-efficient 25mm dome tweeter with integrated phase plug for crisp clear highs even at highway cruising speeds. 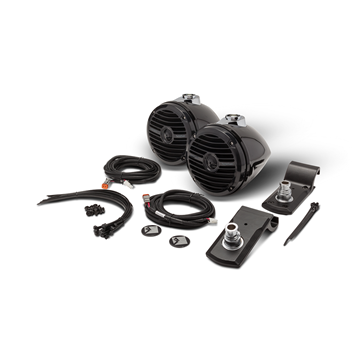 With the update of the 2014+ Harley-Davidson® motorcycles, audio upgrades can be challenging. To overcome this, we now offer our front audio upgrade featuring a plug & play amplifier wire kit, a Power series small chassis, 4-channel amplifier and our new 6.5" direct fit speakers. This allows you to quickly upgrade your audio from ho-hum to holy-cow with no modifications or compromises to the bike or its systems. If you need more than just two speakers and want to really feel your music while riding then check out our add-on bag lid audio solution. 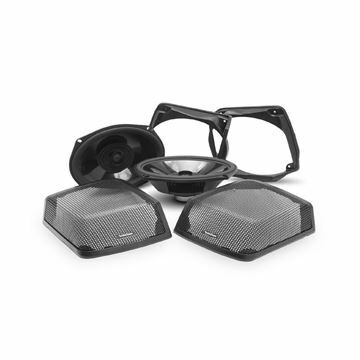 Centered around our TMS69 6x9" speaker this kit is designed to work with your existing OEM bag lids. This means no extra parts to purchase or custom paint schemes to match. Easy to install using our included cutting template and two-piece mounting system you can quickly add on to an existing or new fairing audio kit using with the included plug and play harness. The harness plugs right into either our Power or Punch small chassis 4-channel amplifiers. 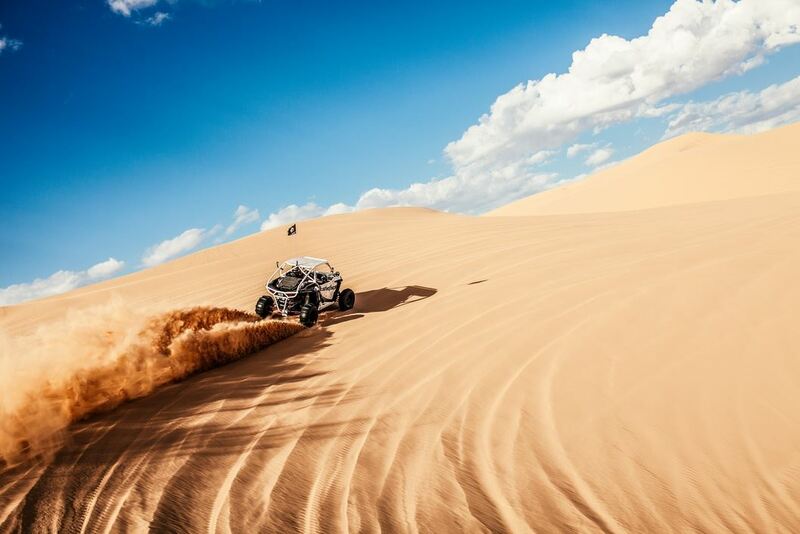 SLPK-POL-RZR800v2 SlamPak™ Audio System for the 2008-Up Polaris RZR Razor owners know that straying from the beaten path is what keeps life exciting. With this intelligent, all-in-one system from JL Audio, you can amplify that excitement by hearing your favorite music loud and clear on your next adventure. 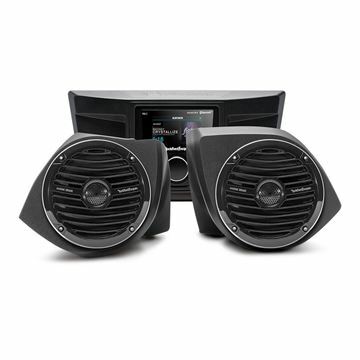 This unique "SlamPak" system features a pair of our MX-Series 6.5-inch marine-grade coaxial speakers, plus a 10-inch marine subwoofer driver, each in its own chamber. Beneath a protective cover, you will find a JL Audio XD four-channel amplifier that uses super-efficient Class D technology to deliver big power with minimal current draw. The SlamPak™ enclosure features weatherproof fiberglass construction and is texture-matched to the Razor's utility bed. The fiberglass enclosure and all of the speakers used in this system are built in our Miramar, Florida factory with global components. Quick installation and removal of the system is facilitated with the included wiring harness, marine-grade, Deutsch® quick-disconnect plugs and four Polaris Lock-N-Ride quick-release mounting clamps that dock with the receptacles molded into the floor of the RZR's bed. The supplied HD-RLC Remote Level Control can be mounted in the front of the vehicle to be used as an easily accessible subwoofer level control. This SlamPak™ package contains: 1 ea. fiberglass speaker enclosure 1 pr. 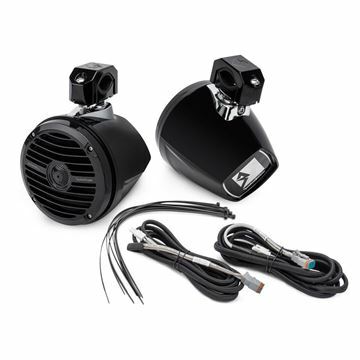 MX650-CCX-CG-TB 6.5-inch Marine Coaxial Speaker Systems (mounted in enclosure) 1 ea. M10W5-CG-TB Subwoofer Driver (mounted in enclosure) 1 ea. XD400/4 Four-Channel Amplifier (mounted on enclosure, with protective cover) 1 ea. system wiring harness (includes power, speaker and signal wiring) 1 ea. HD-RLC remote level control Illustrated installation and setup instructions. Will not fit Polaris RZR XP900 models. If the mini-can option isn't for you and you want more sound up front, then our Stage 5 kit is what you're looking for. Also building on our Stage 3 kit, the Stage 5 kit adds our upper speaker pod assemblies and a second pair of RM1652B speakers for that maximum in your face music experience. With the same plug and play design as the rest of the kits, you'll be tearing up the trails in no time. 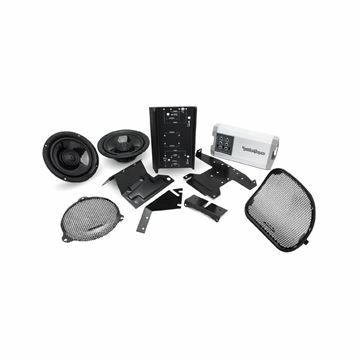 Our Moto-Rear2 kit allows you to add the Rear RM1 speaker option to either our Stage 2 or Stage 3 kit. Including the mounting brackets and wiring harnesses, the installation is a snap to do. So if you decided to not go all-in the first time, you can now complete the package and cruise in style. 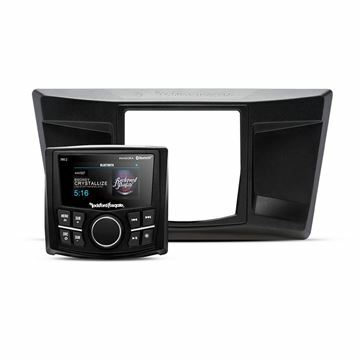 Our Stage 1 kit lets you easily add the PMX-2 digital media receiver to your YXZ using the included dash mounting kit. Coming prepackaged with all necessary hardware and pre-terminated wire harness, this kit allows you to quickly upgrade your YXZ with minimal time and tools required. 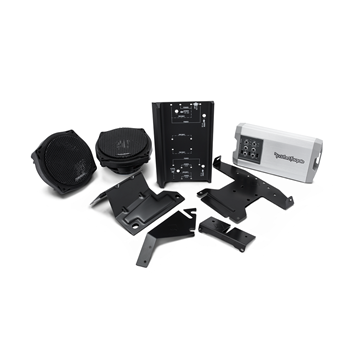 Our Stage 2 kit includes the components of the Stage 1 kit and adds front speaker enclosures and a pair of RM1652 speakers. 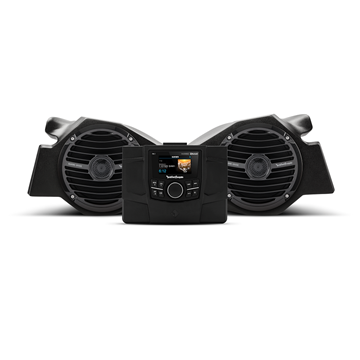 This is ideal if you're looking to add some sound to your ride but may not be ready to add the amplifier or a subwoofer system yet. 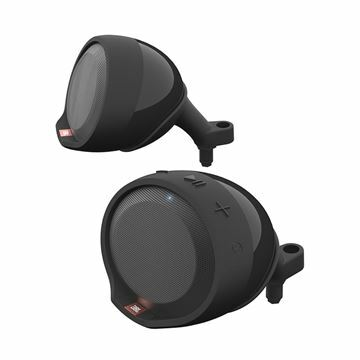 JBL Cruise is the world’s first universal handlebar mounted Bluetooth audio system engineered for motorcycles and scooters. Not only does Cruise provide exceptional audio reproduction, but it allows the user to charge their mobile device from the vehicle’s battery. JBL Cruise’s design is aerodynamic, compact, waterproof and easy to operate.